Last week we had shared about the top 6 products we will be exhibiting at GITEX. 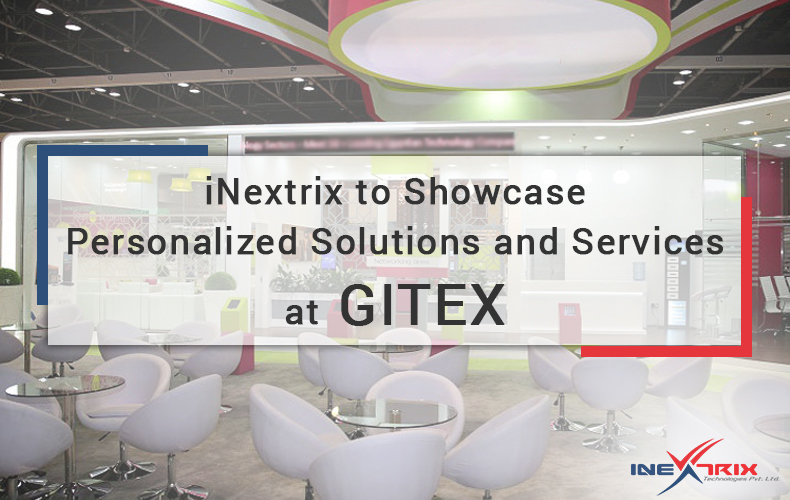 We have considered the fact that the expo like GITEX that welcomes more than 100,000 visitors will get different types of audiences and the GITEX visitors must be looking for the reliable IT companies that can help them to build a custom solution. Furthermore, we have some other advanced solutions that can fit in certain businesses in a way that it can increase their business growth and ROI. Thus, we have decided to showcase some more solutions and services to our stand visitors at GITEX. We will try to understand the business models and needs of our booth visitors and based on their need, we will educate them with the best fit solution and services. We are willing to benefit our booth visitors with our expertise and experience. The previously announced top 6 products can empower many enterprises, so our representatives will be marketing those during the expo. At the same time, we will suggest personalized solutions and services to our booth visitors. We are open to discuss opportunities related to any of these solution development services to our GITEX visitors and interested prospects. Smart devices are ruled by the useful mobile applications. We have been catering our customers with the native and cross platform mobile application development. We have expertise in leading mobile app development platforms, iOS and Android. During GITEX Technology Week 2018, we are willing to benefit our visitors with our expertise in mobile app development. Along with these custom services, we have some more interesting solutions in our bouquet which can benefit the SMB to large scaled enterprises. We will be exhibiting those solutions, if our stand visitors are looking for any as such solutions. This is a powerful and personalized platform that can be used to run voice broadcasting campaigns. Our broadcasting solution also supports fax, email and SMS broadcasting campaigns. This solution empowers businesses with a highly personalized communication tool. It is available at one time cost as well as on a monthly subscription based usage. We are all set to exhibit it to interested booth visitors during GITEX Technology Week 2018. The IP PBX solution can be used to consolidate telecom infrastructure with unified communication features and increasing ROI by reducing the telecommunication expense. On the other hand, hosted PBX system is a platform to run the business as a VoIP Phone Service provider. We have both of these solutions in our offerings as ready to buy solutions and we are excited to offer those to the GITEX visitors who are interested in this type of solutions. This is the solution that is important for all types of businesses. It creates a robust system to assure all your data and applications are available round the clock. It creates clusters of website, database, applications and solutions in a way that it can minimize the system downtime drastically. We provide this solution at one time fee. The GITEX visitors will be educated about this system. All of these 3 solutions are available with one time license fee or monthly fee for subscription based services. We are happy to take personal meeting invites to discuss your requirements. To initiate a meeting request, contact us. Feel free to visit us at stand: B1 – 20; Hall: 01; Dubai World Trade Center, Dubai to discuss possible business opportunities during GITEX Technology Week 2018. We are looking forward to see you there!